Hello! I just did the random number select, it was lucky #23, which means the winner is Karen MERC. Karen, please email me: natashatrupp(a)gmail.com [replace (a) with @] or leave a comment with your email address so I can get your mailing address. Thanks! You knew I just couldn't stay away until the new year. 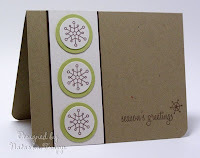 I have a giveaway, it's completely related to the topic of the blog-clean and simple. 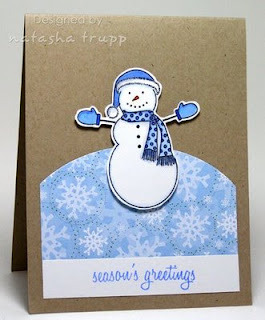 I've got a spare copy of PaperCrafts: Card Creations Quick & Easy Volume 2 to give away. I've got a card that was featured on this blog in there on page 36! Leave a comment to be entered into the draw. I will do the draw around noon CST on Dec. 27. Merry Christmas! Happy Holidays! Happy New Year! 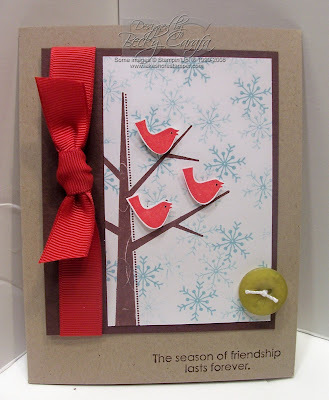 This weekend I had a small cardmaking get-together with a few friends. Last year I had provided a few designs, so I wanted to do something similar. However, I was being quite the procrastinator when it came to coming up with projects. So at 12 (they were supposed to be dropping by at 2), I got to work. First I looked through my inspiration folder and printed off a few samples. I brought that with me and started designing. So I have four designs to show today. They are all easily done in under ten minutes! Remember that you should be able click on the photos if you want to see a larger version. Here's the first design. This one was inspired by Becky Oehlers. I really liked how stunning it was in its simplicity. 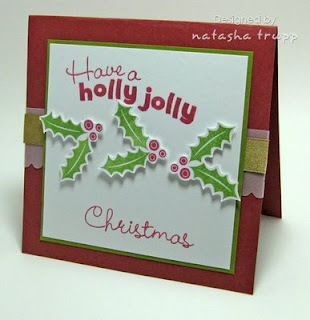 I offered different patterned papers and used magic tape to apply the glitter. 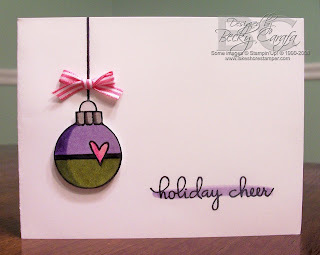 You can punch out circles from that tape making for very quick glitter application. 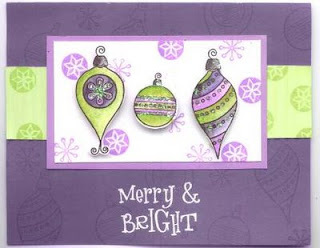 Also I offered different metallic inks for the ornament and greeting and matching metallic cords. The second design is also a very simple design. I got the idea from Julie Ebersole. Again I modified the design. 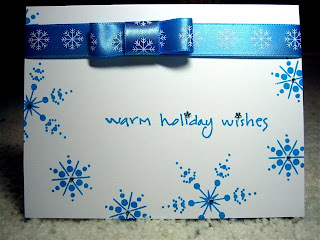 I omitted the glitter, added a thicker, brighter ribbon and placed the greeting within the Good Things Grow squares. 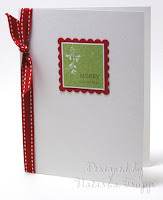 For this I offered a few different options- the mistletoe image or the bow image. As well I offered red scallops and ribbon or chocolate scallops and ribbon. I love the design. There's something very satisfying about all that open space. 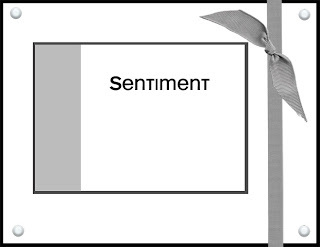 The third design was inspired by Judith Novak. 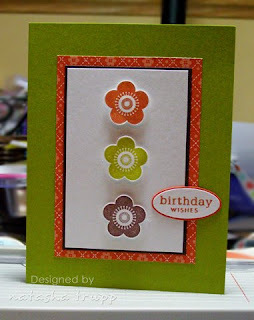 (Sorry I couldn't find the link to the exact card, she used the PTI anniversary set and had raffia and some distressing). 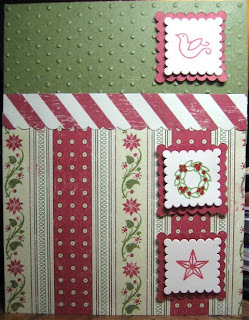 I used the Rustic Snowflakes set and left off the ribbon. I also went with a slightly different colour palette. The fourth design was inspired by a recent Nichole Heady design. 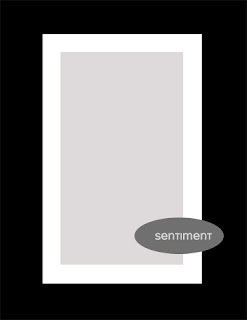 This card deviates the most from the inspiration piece. Sometimes all you need is a slight idea to get you creating. That's what happened with this card. I liked the idea of making a line, but markers can smear. And I liked the cut out hearts, but I was planning on snowflakes and I know my friends are not as keen as I am about cutting things out. I went with a circle punch instead. To make the illusion of a outline I made a thin dark layer- simple. So there are the cards we made. I think they enjoyed themselves and were quite pleased with their creations. 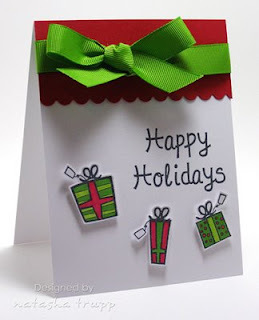 I know we've still got 10 days until Christmas, but this post is my last post for the blog this year. I will be updating a bit more regularly at Palmtrees & Pogosticks over the next weeks. I just wanted to give a heads up that I'm taking a mini-break from the CAS blog. I expect to start posting again around January 2nd. 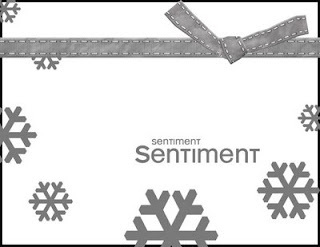 May you have a wonderful holiday season and happy new year! Thanks for stopping by. I truly appreciate it! This week I thought I'd end things a little differently. 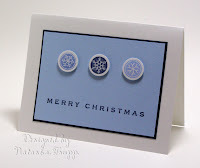 Since Christmas card season in upon us (and I'm not talking about the making of them, I'm talking about the receiving of them), I thought it'd be fun to find a design you like and then make your own version of it. 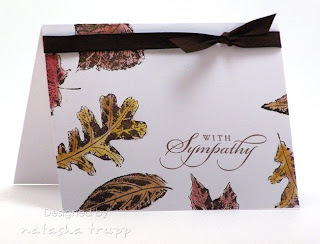 If you haven't received any really inspiring designs, feel free to check out some of websites. 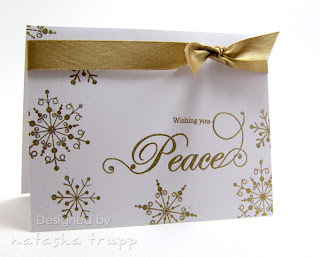 We received this card- the company on the back says Golden Gallery (just did a google search, nothing seemed to pop). Anyway, so here's my inspiration piece. I did a few things differently. 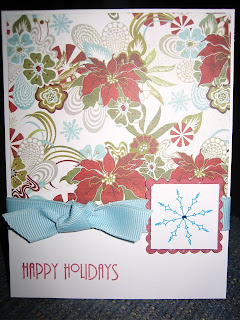 For one thing, I went with even scallops, added an extra layer of silver, also went with Baja Breeze as my blue, and I used a non-uniform patterned paper. I'm pretty sure you can pick up the resemblance though! 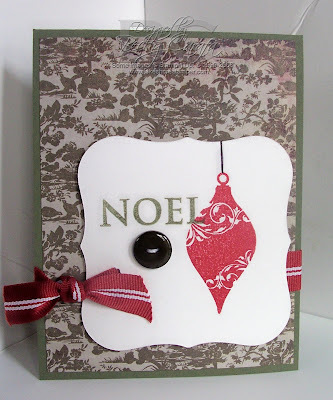 I really wanted to add beads of silver, but the patterned paper I chose just didn't work with that concept. 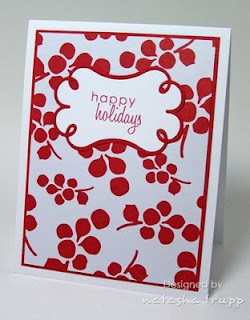 I didn't want to ruin it by stamping and embossing any other designs or even dotting it with a gel pen. 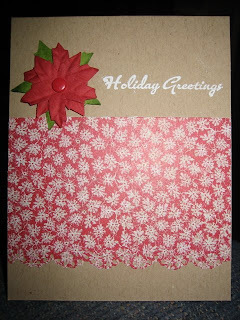 I just left it, and added the silver scalloped layer instead. I would love to see your take on this challenge. 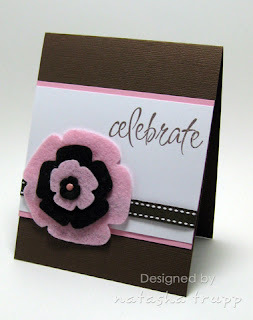 Find a manufactured card you love and recreate it! First of all, here's the card. I couldn't be happier with how it turned out. It just fell into place. I think I may make a bunch more to send out. Although I feel like it's cheating a bit since there is really that little that I have to do. Fast forward 2.5 hours, I go to open up my new die, it's completely the wrong one. I had picked up the flower one and it was this strange label. Ummm, no thanks. So I decided to go back right then, I might as well get it all sorted out. I had a great clerk, she was really helpful and nice as I tried to explain my multiple problems. Well then, I pulled out the paper, it's kept in a cardboard casing by the way, and it slices into my left ring finger. You know how a papercut is annoying and mildly painful, well a cardboard cut is several times worse, you might as well use a knife. I held my finger in my hand, expecting it to stop shortly. Since my hands were abnormally warm, it was bleeding pretty badly. I asked for a kleenex, which of course they didn't have any of. The manager asks if rough paper towel is okay, she's holding up a giant roll, I say "great!". I ended up going through two lengthy sheets, but I kept it all contained. Like I said, it might as well have been a knife wound. It finally stopped some time on the drive home. It was quite ridiculous, this is just so typically me. Keep in mind this is the same week that I already had cut one other finger with aluminum foil (not the blade edge, the actually foil...), as well as receiving some other mysterious cuts on my hands. Apparently my hands just are too soft right now?? Well, anyway, I managed to get everything for the right price, I ended up getting $25 back, so I guess it was worth it. So that's my story, but hey, I've got the paper now. It's time for another fall-to layout. This one works really nicely when you have a long focal image that you want to show off. This layout also can be easily dressed up or down. I kept mine very simple. 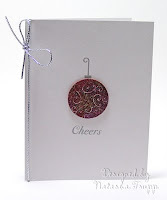 If you're going to center a column of images then you may want to go with an oval that's the size of Stampin' Up! 's smallest oval punch. I found the larger one was just too big for my version of the layout. If you play along leave a link in a comment or upload to SCS with the keyword FTL22. Thanks! 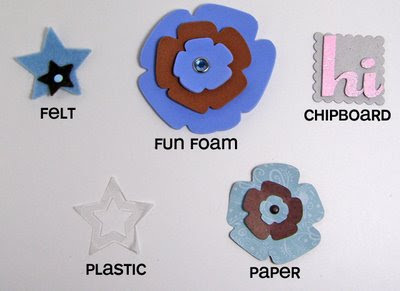 To make embellishments with any of these items, all you need is a die, die-cut machine, or scissors. Run the media through your die cut machine and you're set. 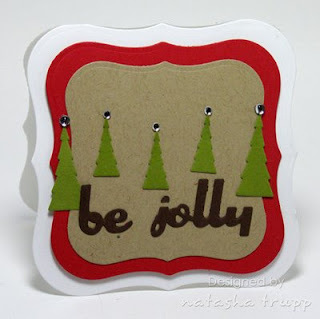 Or, if you are feeling like something a bit more unique, freehand a design and cut it out! 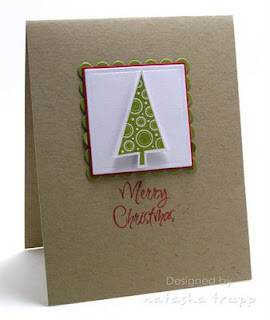 Now, to keep things clean and simple, use these embellishments as the focal points on your card. After all that work to make something cool and unique for your card, show it off! Here's my sample for this weekend's sketch. Even though I used a floral graphic on the sketch doesn't mean that the focus needs to be floral. I went with something still in the nature family- holly. Here's the weekend sketch. I went with a square design this time. If you play along, leave a link or use the keyword FTL21. I'll be updating tomorrow with my version. Enjoy the weekend! Hello! I'm so glad it's the weekend. I haven't had much time for anything this week. Doing something every night is a bit much sometimes. I certainly don't mind be a homebody at times. 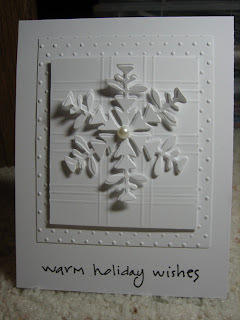 For this card I used my Cuttlebug, a Cuttlebug snowflake die and my nestabilities. 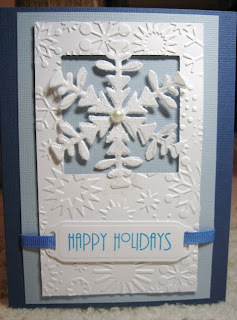 After cutting the snowflake out I put it into the accompanying embossing folder and ran it through the Cuttlebug again. Then I smooshed (very technical term!!) it onto the glue pad and then added sparkley diamond glitter. 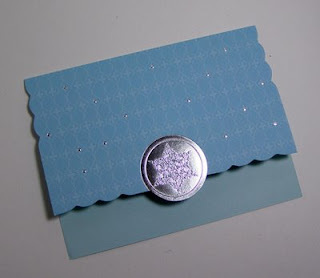 With this glue pad you don't even need to use a heat gun for the glitter to stick! 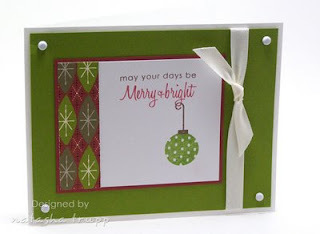 I used my Nestabilities to cut out the mats and ran the bottom mat through the swiss dots embossing folder. 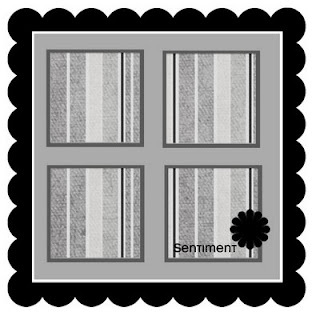 I used my Scor-pal to score a pattern on the top mat. 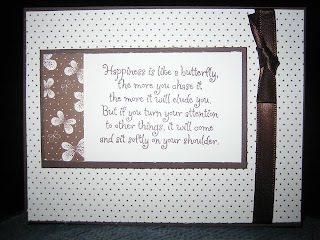 I finished the card off with an adhesive pearl and the sentiment. 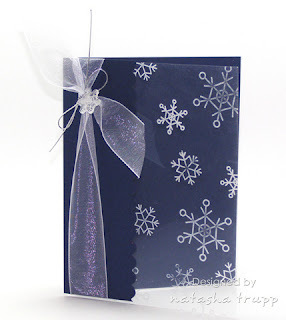 Supplies: Stamps - Printworks; Ink - Memento; Paper - PaperTrey Stampers Select; Misc - Cuttlebug, Snowflake die, Snowflake embossing folder, Scor-pal, self adhesive pearl, glitter, The Essential Glue Pad. Today's first card is a bit of a blast from the past. 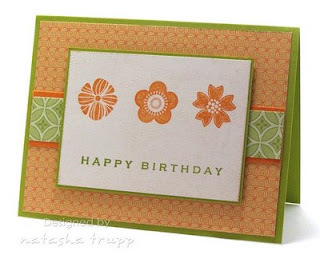 Its layout is simple, however it's not exactly a quick card. 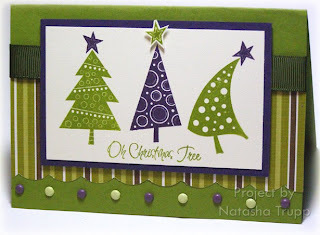 It is one my favorites though, and it showcases exactly what I wanted to today: using non-traditional colour combinations for the holidays. It's nice to step outside of the red and green box, even go beyond the blues, whites, and metallics. 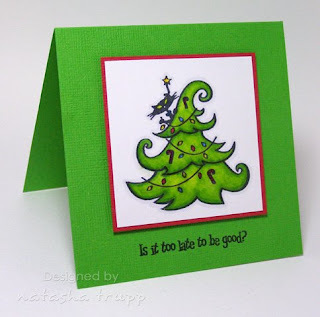 Okay, so here's the first card, it features some good old watercolouring using reinkers. 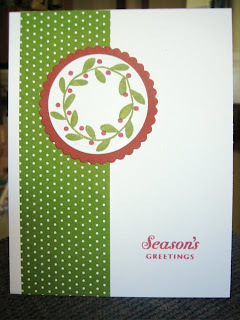 Even back then I was quite the fan of pop dots (the card is from 3 years ago). Today's sketch was inspired by this cute collection by Kristina Werner . It seemed like the perfect type of layout for keeping it clean and simple! Here's my version of the sketch. 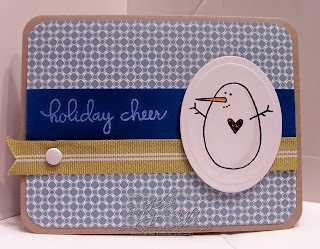 I really liked how the snowman looked, so I used that idea, and place him on a heap of patterned snowy paper. I'm not nearly patient enough to sketch out a snowman, clean him up with the computer, then reprint and paper piece together. I found that PTI's Made of Snow worked for me. I chose my patterned paper first and drew my colours from there. For the rounded part, I cut my paper to 3-3/4 wide, then I used one of the long, large oval nestabilities. I tried a circle first, but I didn't have one big enough for to get the curve exactly as I wanted. Ovals, however, worked wonderfully! A concept I'm sure many people are already familiar with, but is always worth talking about is the concept of the rule of threes and using visual triangles in your designs. When talking about the rule of threes and card making, I typically apply that to grouped items. 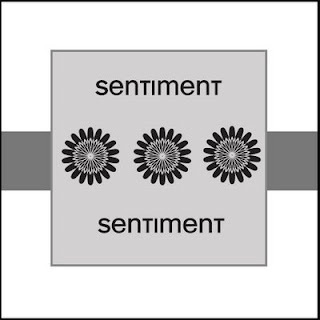 If I'm stamping a few flowers for instance, I try to either have a group of three, an odd number, or in some cases, multiples of three. I have found that a grouping of 6 can work, simply because it's 2 groups of 3. Basically, it's just tends to be more interesting to the eye to work in odd numbers, especially threes. 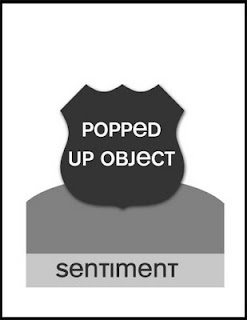 Now, when I talk about the visual triangle, I usually refer to the actual layout or placement of elements. Any 3 points (there's that number again) can form a triangle, the shape of the triangle doesn't usually matter. I find that this triangle is achieved easiest by using similar items or colours. 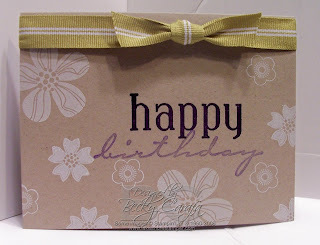 Something as simple as a black outline of an image stamp, a black sentiment, and some black ribbon or matting; or repeating a visual item, such as flowers in pattern paper, in your images, and in your embellishments. Once you start to look for these triangles though, you really start to see them everywhere! The only problem with these concepts are that they seem overly technical and stamping is about the fun and the creativity. So try not to overthink it. However, if you come upon a design that just isn't coming together, step back and assess things. Once you get used to this idea, it starts to come naturally. Okay, so here's my card. 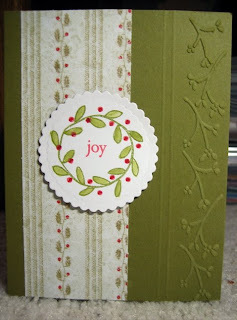 I went with some of my favorite paper and this fun font- it's a Quickutz die called Chocolate. Love it! In case you are having a hard time seeing the triangles, or what exactly I mean by visual triangle, here's a diagram. 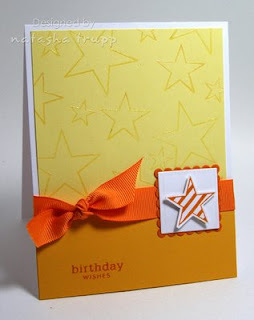 I'm using the colour orange as my triangle/group of 3. You could even draw a triangle based on the vanilla items (the ribbon, the paper behind "you rock", and the background part of the flower). 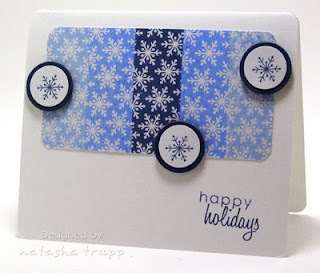 Although this layout is nothing unusual for me, it was sparked by someone's card. 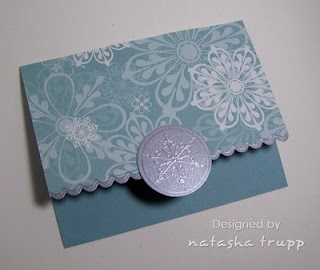 Every so often, I mention other stampers that showcase the clean and simple style quite nicely. 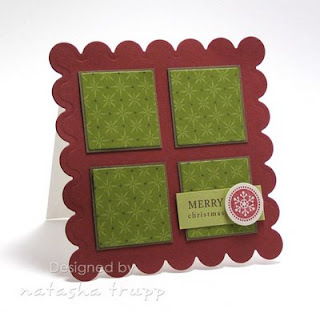 Tracy Durcan is one of those stampers, I just love everything she does. 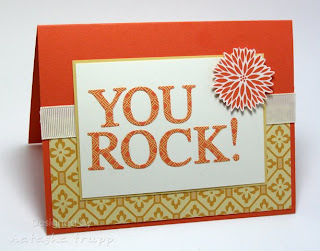 You can check out her blog here (this is the post that sparked this card, scroll to the end for the specific piece of inspiration). 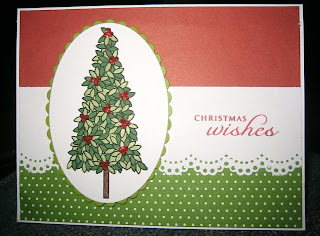 I was going to use glitter on my card, but I found it actually took away from it, go figure!